The Lanyang Taiwanese Opera Company was founded in1992 as part of Executive Minister Yuo Shi Qun's policy to propel internal cultural development, initiated during his term as County Magistrate. One significant effect of the event was the creation of the only Taiwanese opera troupe ever founded by a local government. 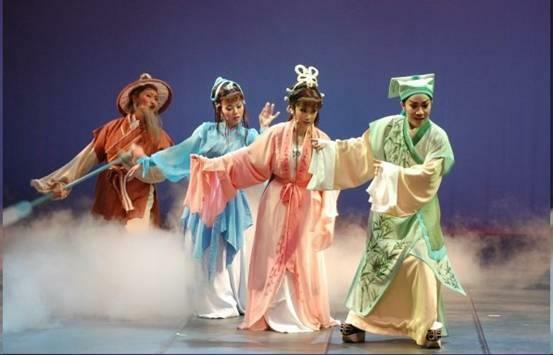 Consequently, the founding of the Lanyang Taiwanese Opera Company has special significant in Taiwanese opera history. Tiandu" and "72 Melodic Variations on the Seven-words Tones" in 1997. The Troupe not only displayed the considerable talents of its musicians, it also broke ground in musical history by performing on a national level using melodies from Taiwanese Opera. In 2002, the Troupe continued its impressive travels by touring eleven locations in the America and Canada . In 2004, the Troupe accepted a second invitation from the Taiwanese Canadian Cultural Society to participate in the "One Global Family" international cultural and performance art exchange program. It presented the performing arts of traditional Taiwanese opera to numerous overseas countries in attendance. The Lanyang Troupe quickly rose to become the epitome of excellence in Taiwanese cultural arts for overseas Taiwanese communities. The enduring mission of the troupe is to preserve tradition while exploring new artistic concepts. While searching for breakthroughs in form, the Troupe also seeks to ensure that the substance of the operas is kept fresh by updating the contents to match changing social contexts. Our goal is use the unique flavor of contemporary Taiwanese opera to gain the stamp of approval of established artistic communities and win over young audiences. Specifically, we will use score, costume, stage design, lighting, and most importantly script, to draw audiences in to deeply experience the vibrancy of our productions. We value creativity, but adhere to traditional ways. This is our mission. With the efforts and support of everyone, the Troupe hopes that the traditional art of opera will again take root and thrive in Taiwanese society as it faces rapid cultural changes, and that in the international arena, Taiwanese opera can convey Taiwanese culture's refinement and distinctive flavor with an endearing artistic performance.